Click to discover the different projects or groups Marcello is currently involved with or simply scroll down. Marcello has performed with triple Aria award-winning world music group Monsieur Camembert since 2005. As a band Marcello has performed in Canada, New Caledonia, Thailand and Laos not to mention locally in Australia. Abuka Trio are the premier purveyors of small group Brazilian music with a mission that it's not just about Samba. Joyous, rhythmic and subtle music that has the capacity to transport you to another dimension. With vocals, semi-acoustic guitar, bass pedal, keyboard, cajon, pandeiro and hand percussion, the trio sounds ravishing. Recent, acclaimed album “One Take” is a great result of continuos work between Tiago de Lucca, Sandro Bueno and Marcello Maio. This is a band whose infused grooves and divine rhythms are simply to be enjoyed. Expect to hear classics and original songs with a jazzy groovy feel, blended to a whole universe of brazilian beats. For more on Abuka check out their website. Live at The Basement, Sydney. A new collaboration between these two lovely songstresses has seen Marcello constantly touring Australia over the last three years with French chanson outfit Baby et Lulu. For more information visit their website. The Graduates are four close friends originally from the Conservatorium that have been working as a corporate band and jazz quartet in Sydney for the last five years. They are constantly in demand between different residencies at Palmer & Co, Macquarie Uni and other clubs. To check out more visit their website. 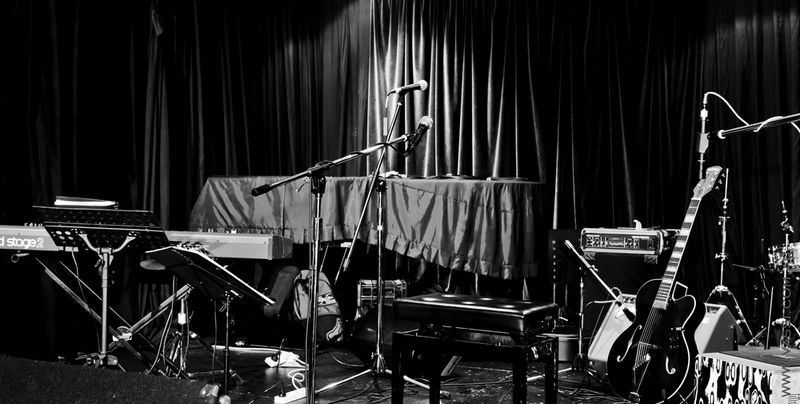 The Marcello Maio Trio has been performing around Sydney’s Jazz scene for the last year. Even though they are a newly formed group they have a large repertoire that draws upon Marcello’s growing original repertoire along with songs from the Great American Songbook and songs from Brazil, Italy, France and Cuba. The trio uses these world music elements to colour the improvisations. They are a regular at venue 505, Bohemian Grove, Foundry616 and SIMA in Sydney. In 2013 Marcello was asked to perform with the trio at the Sydney Theatre Annual Fundraiser Ball where esteemed artists Cate Blanchett and Hugo Weaving were present. Marcello is currently working on an accordion trio specific album to record towards summer of 2014. The trio members vary depending on the approach Marcello decides upon. In the photo above, Dauno Martinez is on the bass and Andy Fisenden on the drums live for Jazzgroove last year. This set was approached completely spontaneously. Classically the trio consists of Alex Boneham on bass and James Waples on drums. 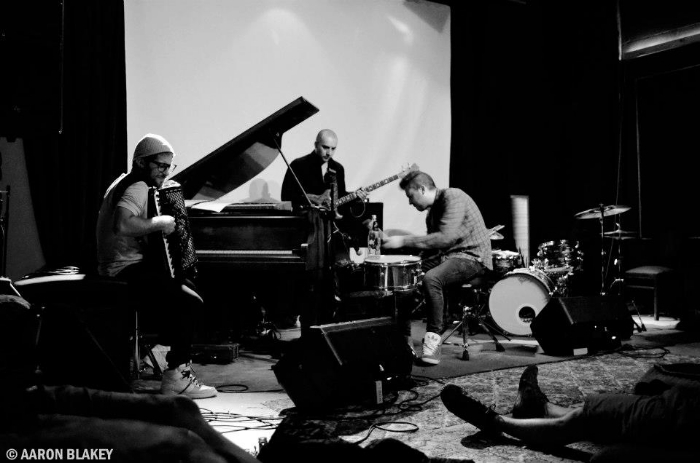 Between them they have played with the who’s who of Sydney’s Jazz musicians along with other musicians from the gamut of Sydney’s music scene. The list includes: Mike Nock, James Morrison, Dale Barlow, Monsieur Camembert, Declan Kelly and Chris Abrahams, The Song Company, Bernie McGann,, James Muller and Vince Jones. You can hear some samples below. In 2012 saw the Village Kids come about as friends Marcello Maio and Salvatore Santoro wished friend and colleague Abraham Rounds on his venture overseas. Before he left they recorded Village Kids - Official Soundtrack. Here is a sample from that album. In Sydney, Marcello is constantly working with The Graduates at different residencies. As a trio here is a snippet of the vibe they bring. Marcello is joined by Michael Walder on bass and Steve Lamante on drums. A unreleased version of Dolphin Dance in the studio with Michael Walder on bass and Ross Ferraro on drums. Under the alias 'Baggins' Marcello collaborates with local and international talent whilst exploring the world EDM and sampled based music. Drawing upon elements of his influences from family and friends to evolve an eclectic electronic cloud of song. A collaboration between acclaimed concert pianist Ambre Hammond saw the duo record their first release in 2012. A collection of music by Astor Piazzolla saw Hammond and Maio interpret his beautiful music for the piano and piano accordion. A haunting, chamber-like quality emerged. The two have been showcasing their music all over the country including notable performances for ABC Classic FM for their Sunday Live series and Adelaide Cabaret Festival. Samba Mundi is a “funky multicultural collective” (Seth Jordan, ABC Limelight) of musicians based in Sydney, who play a style of Brazilian and Latin grooves with elements of Jazz and other World Music. They began as a trio in 2004 and have now evolved into an exciting and extremely groovy collection of 5 to 12 musicians. The band has performed at the Manly Jazz Festival, Bondi’s South American Festival and popular city venues like the Hilton’s Marble Bar, the Annandale Hotel, The Factory and The Vanguard. They have recently featured and closed the 2009 Bellingen Global Carnival. The band has played along with players from New York’s prestigous Mingus Big Band and contemporary Brazilian artists Gabriel Grosso (Hamilton de Hollanda) and Daniel Santiago.